This book is a collection of well-known disasters, including the Titanic, the Chernobyl meltdown, and the Exxon Valdez oil spill. A court case document published by Matthew T. Lee from the Department of Sociology and Criminal Justice at the University of Delaware in 1998. A quick clip of a Ford Pinto exploding after being rear-ended. A court case document from the Court of Appeals of California on May 29, 1981. This NTSB report outlines some of the fuel tank problems in subcompact passenger cars, especially with regard to the Ford Pinto. This report summarizes the findings from an investigation into the Ford Pinto's fuel tank design, which often exploded after rear-end collisions. 1971 Chevrolet Impala into 1972 Ford Pinto (29.01 mph). 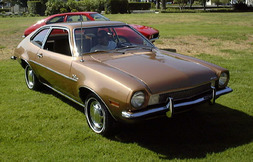 This 1977 article by Mark Dowie highlight some of the major flaws in the design of the Ford Pinto. A diagram posted by Mother Jones in the September/October 1977 politics Issue. With the release of this document, the Ford Motor Company announced the recall of some 1.4 million Pintos and Bobcats in 1978.